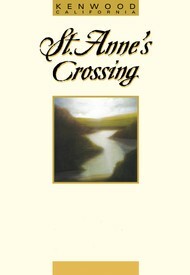 St. Anne’s Crossing is one of the latest additions to the Wilson Artisan Wine Family. This terroir-driven winery is perfectly situated in the heart of Sonoma Valley. Allow us to guide you through the terroirs of Sonoma County with award-winning wines and local history. Savor the breadth of flavors and nuanced differences between the same grape varieties grown only a few miles apart. Let us educate your palate while pleasing your senses. Astounding aromas of warm blackberry scone, wild boysenberry, and cardamom continue onto the palate to join flavors of rhubarb jam, black currant, and ground white pepper. The supple tannins linger with notes of mulberry, black peppercorn, and dark chocolate on the finish. Perfect Pairing: Pair this cool-climate Zin with mushroom ravioli in a brown butter sauce or mushroom risotto topped with venison medallions. Seductive aromas of fresh strawberries, sliced peach, and a beautiful bouquet of flowers lead into a palate of wild strawberry, homegrown watermelon, and lemon zest flavors. The gentle and refreshing finish lingers with notes of raspberry, ripe nectarine, and flint. Perfect Pairing: The light body and crisp acidity makes this an ideal pairing for warm mushroom quiche or a roasted beet salad topped with goat cheese and pistachios. Extraordinary aromas of fresh boysenberry galette, bay leaf, and white peppercorn dominate the nose while wonderful flavors of lingonberry jam, plum, and lavender intertwine perfectly on the palate. The smooth finish lingers with notes of wild raspberry, mocha, and allspice. Perfect Pairing: The strong backbone and defined tannins make this the perfect pairing for homemade mushroom pot pie or Korean BBQ pork ribs.